From the Elegance Patio Furniture Collection by Kettler International, Inc.
Indulge in the exquisite beauty and romantic style of the Elegance Wrought Iron 2 Seat Bench, from the Elegance Collection of Wrought Iron Patio Furniture by Kettler International, Inc. 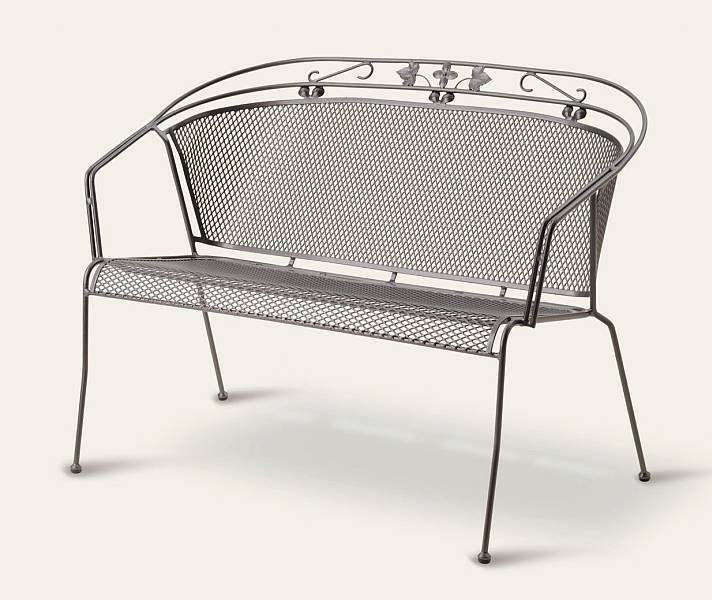 Marked by ornamental ivy accents, a contoured barrel design for exceptional comfort, closely knit iron gray mesh on the seat and back, and delicately curving lines, the Elegance Chair will add a touch of romance and luxurious comfort to any backyard patio, deck, or garden. Each piece in Kettler's Elegance Wrought Iron Patio Collection undergoes an exclusive sintering process called ThermosintTM, which gives the furniture a coating that is up to 8 times thicker than traditional powder coating finishes. Kettler's ThermosintTM coating is flexible and resilient, resisting all weather conditions. Elegance Patio Furniture is not only beautiful, it is virtually maintenance free -- simply spray with a hose or wipe with a soft cloth and mild soap when necessary. 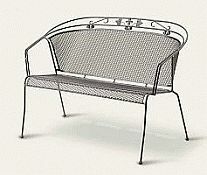 Residential Warranty: Wrought iron frame & finish guaranteed for 5 years. Commercial Warranty: Finish guaranteed for 5 years; wrought iron frame for 1 year.